Carnitine has beneficial effects in different pathologies and prevents acute ammonia toxicity (ammonia-induced death of animals). Acute ammonia toxicity is mediated by excessive activation of the NMDA-type of glutamate receptors, which mediates glutamate neurotoxicity. We showed that carnitine prevents glutamate neurotoxicity in primary cultures of cerebellar neurons. This supports the idea that the protective effect of carnitine against ammonia toxicity is due to the protective effect against glutamate neurotoxicity. We are studying the mechanism by which carnitine protects against glutamate neurotoxicity. Carnitine increases the binding affinity of glutamate for metabotropic glutamate receptors. The protective effect of carnitine is lost if metabotropic glutamate receptors are blocked with specific antagonists. Moreover, activation of metabotropic glutamate receptors by specific agonists also prevents glutamate neurotoxicity. 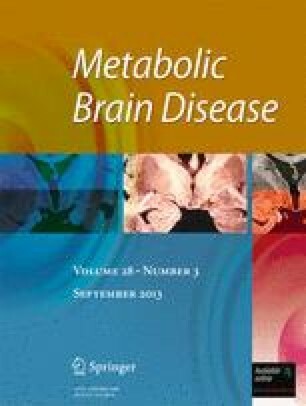 This indicates that the protective effect of carnitine against glutamate neurotoxicity is mediated by activation of metabotropic glutamate receptors. The molecule of carnitine has a trimethylamine group. Different compounds containing a trimethylamine group (carbachol, betaine, etc.) also prevent ammonia-induced animal death and glutamate-induced neuronal death. Moreover, metabotropic glutamate receptor antagonists also prevent the protective effect of most of these compounds. We summarize here some studies aimed to identify the mechanism and the molecular target that are responsible for the protective effect of carnitine against ammonia and glutamate neurotoxicity. Finally it is also shown that carnitine inhibits the hydrolysis of inositol phospholipids induced by activation of different types of metabotropic receptors, but this effect seems not responsible for its protective effects.